james and i just finished puppy sitting for some friends. their house is super quaint and beautifully located in the middle of the woods. 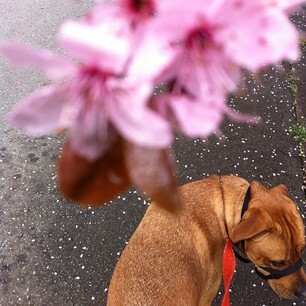 it was absolute bliss taking sid the puppy for walks amongst the smells and sights of spring. his schedule forced me to rise early, but after the first couple days, i got used to it and fell in love with those early mornings. the ornamental cherry blossoms were at their peak for the two weeks of our stay. the smell and look of those trees always makes me giddy. now sid's loving parents are home. (oh, you should definitely check out their blog!) and james and i are moving into a home of our own! it is a very exciting time for us. james rented a big truck on sunday and i helped him carry all of our possesions into our new place. james will live there until we're married. but lets not kid ourselves, i will be over allll the time, nesting and decorating and cleaning and making him chilli for the week :) such an exciting new chapeter in our life! i can't wait until it starts to look like a home, that's when i'll post photos. for right now, it's a mess of boxes and bags. i hope you are all enjoying this sunny, spring day.